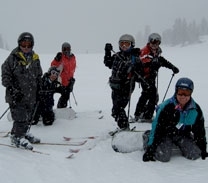 Though a group of dedicated volunteers, ASBCLA offers various local and out of state ski trips each winter as well as other indoor and outdoor sports and activities throughout the year. ASBCLA typically runs several weekend chartered bus and drive up trips to Mammoth Mountain. ASBCLA usually offers at least one extended trip to an out-of-state or overseas ski resort per year. For the 2012 season, the club will be skiing in Jackson Hole, WY. ASBCLA is a non-profit organization, so our members get a really good deal along with a no hassle, fun-filled trip! Our trip leaders are all volunteers who put a lot of effort into coordinating and organizing, and thus appreciate members' willingness to pitch in and help out as well. Non-members are welcome to join us on our trips, but do pay a slight premium over member rates. So membership does have it's privileges! If you have a question about ASBCLA, check out our FAQs section — someone else may have had the same question. If you still have any questions regarding trips, activities, policies, etc., feel free to e-mail us at: trips.asbcla@gmail.com.